As part of its press conference to lead into CES this year, Qualcomm has announced that it is retiring the S1, S2, S3, and S4 series mobile chips, and is ushering a new generation of processors. The new set of chips will still be under the Snapdragon name, but will go by new numbers - 200, 400, 600, and 800 - and promise to offer pretty impressive advances in power and speed. The Snapdragon 200 and 400 series chips will be used for low-end and budget devices, so we'll focus more on the powerhouse chipsets - the Snapdragon 600 and 800. The Snapdragon 600 is the chip that is essentially the direct upgrade point from the current top-of-the-line Snapdragon S4 Pro, with moving the quad-core Krait CPU to the Krait 300 and the Adreno GPU to the Adreno 320. Qualcomm is claiming that the Snapdragon 600 will offer 40% better performance compared to the S4 Pro, and this series of chipsets is expected to hit the market in Q2 2013. The top of the line is the Snapdragon 800 which plans to push forward every aspect. The quad-core Krait CPU get bumped to the Krait 400, running upwards of 2.3GHz per core, and supposedly will offer 75% better performance. The Adreno 330 GPU promises double the graphics power. Additionally, the chipset will offer a faster LTE Cat 4 modem, faster 802.11ac Wi-Fi, QFHD video recording, support for display resolutions up to 2560 x 2048, and components tuned for lower power consumption. 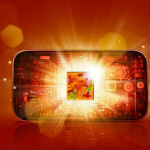 The Snapdragon 800 series will start hitting devices mid-year, and will be available in both smartphones and tablets. S4 is widely successful so why drop the brand? I'm sure many people will be confused by Qualcomm new branding. And I'm disappointed that nothing was revealed about new chips features, lots of music and little information. This is pale in comparison to nVidia spectacular show yesterday. I think nVidia will beat Qualcomm this year. whats the different between the cores used in Tegra4 and the new Qualcomm?..are they the same A15? No Qualcomm Krait(old krait and new krait 300/400) are custom made ARM Architecture. A15 is different. so Krait 400 then can exceeds Exynos?.well i thought Exynos 4 or 5 has the same quad core A15 and so is the nVidia too right? Krait has not been released so it is hard to tell.but here is estimation. Krait 400 is said to be 70% faster than S4 pro. S4 pro had 3.3DMIPS/MHz so krait 400 will have 5.6 DMIPS/MHz. Exynos 5250 which had 4.6 DMIPS/MHz. Samsung is moving from 32nm to 28nm. So it may increase to 5 DMIPS/MHz at max. Maximum clock rate of krait 400 will be 2.3GHz while of Exynos will be 2.0GHz. So considering this Krait 400 will be faster than Exynos 5 series(approx 20%) . This is my next(phone processor). :¬O As Axl Rose once said: "Where do we go? Where do we go now? Where do we go?" Tegra 4 is ready for OEM's but Qualcomm new series will out only in H2 this year. haha you were saying king? 75% increase in CPU performance and double the graphics power of the S4 Pro quad means the 800 should compare VERY nicely to the Exynos 5450 and T4. Let's just hope Qualcomm's claims are right, and 2013 will be a very good year for consumers, more specifically, mobile gamers. Still waiting on that Exynos 5450, though... Maybe Samsung will get taken off its throne? wowza! i'm still on OMAP4 over here! with a little less than a year left on my contract(which actually doesn't matter because I'm not buying subzidized phones anymore) and two whole generations of chips have passed. I bet by the time I decide what phone to get a 3rd will be around the corner if not already out. T_T Dude, i'm still in S1 here.. at least OMAP4 is dual core.. i'm still stuck in single core S1.. :( But the S4 is coming today! Qualcomm rocks, but any info about Qualcomm 200 and 400? So 600 and 800 is A15 processors like Nvidia tegra 4, or are they Still A9 processors like Previous Kraits......???? neither. Qualcomm does not use ARM designs directly like Samsung and Nvidia. They use them for compatibility reference but the design is Q's. It's a double edged sword that until recently was hurting them in the long game.